We require a deposit of 30% to hold your reservation. We accept the remainder of your payment the in cash only due immediately upon your arrival. All payments are final non-refunable and non-transferable. 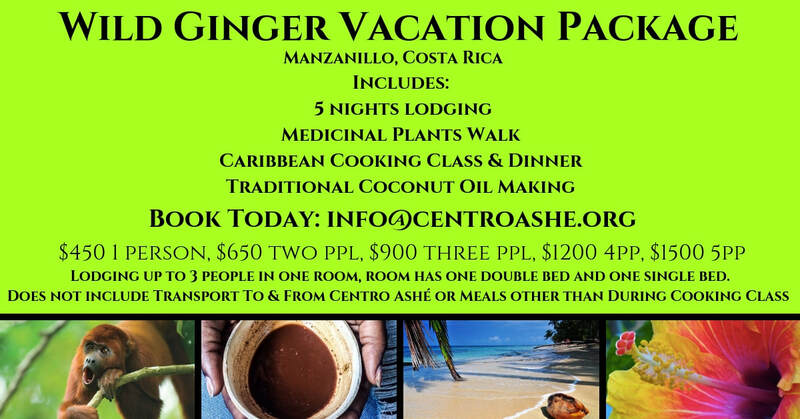 Wild Ginger Herbal Center has our rustic and simple cabinas are located in the heart of Manzanillo, one block to the Caribbean Sea, surrounded by our healing gardens! Our studios are available for rent for daily, weekly, and monthly rates. This is a budget friendly and rustic cabina great for those who are looking for simplicity surrounded by gorgeous gardens and amazing proximity to the Caribbean Sea, just one block away! This is a historic wooden structure, surrounded by noni, mango, guanabana (soursop), bidiba (custard apple), cinnamon, ylang ylang, nance, amapola hibiscus, medicinal plants and more! We have two cabina options onsite, one with a simple kitchenette and one with out. Each are open concept, including a double bed and a single bed, private bathroom, mosquito nets, and wifi. The room with the simple kitchenette has a hotplate, pots pans cups utensils, coffee maker, fridge. Casa Ashé is home to Centro Ashé an herbal education center. We are located on the Caribbean of Costa Rica in the quiet fishing fishing village of Manzanillo, it is usually high 80's during the day in in the 60's at night. Public bus: Transporte Mepe - There is a direct bus to Manzanillo de Talamanca, leaving the terminal (Terminal de San Carlos) in San Jose at 12:00 pm. It arrives here between 4:30 and 5:00 pm and costs about $12 p.p. You could also take a bus to Puerto Viejo de Talamanca and then take a taxi for the last 14 km. The taxi will cost you about $15. From the airport it will cost about $30 taxi ride to get into downtown San Jose to take the bus. Private Taxi - we offer private taxi service from San Jose or Airport for $200 directly here to Manzanillo (additional charge of $20pp above 4 people). 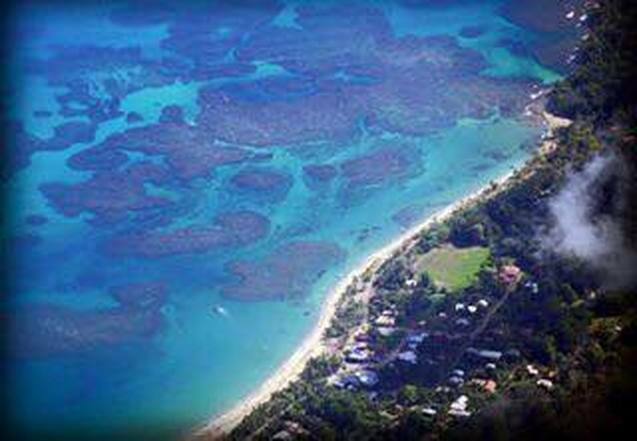 We offer private transport from other areas of Costa Rica as well. Shuttle Services - Interbus and Caribe Shuttle - You can pre book a Private Shuttle companies offer air conditioned shuttle to pick you up at the airport for or at a San Jose hotel for about $60. You can tell them to bring you to our neighbors at Cabinas Yamann (they have that name registered in their system), and then we are directly down the street. Rent a car - You can rent a car to travel around the country. At the airport you can find several companies. We recommend "Poas Rent a car" because they also have an office in Puerto Viejo. If you want to pick up the car, at the airport, it is better then to make a reservation before. Nature Air Flight - Generall Nature Air will fly to Limon, and from Limon you will need to take a taxi down to Manzanillo, which will cost an additional $70. What to Bring: An open mind, heart, and soul, and a flexible attitude goes a long way while traveling, especially on "Tico Time"! Come prepared with clothing appropriate for tropical heat and tropical rain. Sandals, Sun protection, waterbottle, hats, bathing suit, beach towels and sarongs (we provide bath towels though ask that your linens and towels do not leave the rooms). While many people take this opportunity to "unplug" you may feel like bringing a wifi accesible device to use while onsite. These are your responsibility and while traveling we always recommend traveling without valuable goods, but take good care of what you do decide to bring. The tropics if infamous for our bugs - there are lots of them around! And next to none of them will hurt you , so you can breathe a sigh of relief. We have mosquitos, for your comfort bring bug repellent, or you can purchase this here in town. Bring your personal care products. We do not have laundry onsite but there are places in the area you may pay to get your clothes washed and cleaned. *A non-refundable deposit of 50% is due upon reservation. We will send you an invoice to your email that is connected to our paypal account, you can pay your deposit with any major credit card. The remainder of your payment is due immediatly upon arrival by cash. We do not give refunds if you choose to change your plans for any reason. Please come with cash in hand as there is no ATM in Manzanillo. *We are located in the small town beachfront of Manzanillo, there is no ATM here, some restaraunts accept credit cards, but its a good idea to bring cash as well. Most places will accept dollars or colones. *We have wifi internet onsite - while it may not be as fast as the US it is great for consistent email and even streaming music or videos for the most part. Remember while you are here you are surrounded by amazing people, beaches, jungles, and more, we invited you to "unplug" and enjoy where you are! *While visiting Centro Ashé please know we are located in the heart of Manzanillo, a small sleepy fishing village, but remember you are a guest in another culture - often folks begin working early around here - you may here neighbors talking, washing clothes, chopping grass, working on their houses etc. Neighbors will sometimes play loud calypso, reggae or salsa music - we invite you to enjoy and relax into the local culture. *Water/Electricity - again please come with a relaxed attitude, we are connected to municipal water and have a back up water tank for water, so for the most part we never run out of water. But every once in a while it is a possibility we may have no water for a few hours at a time. This is usually something that is rectified very quickly. Your shower will have warm water, but works best based on a certain amount of water pressure, if its too slow or too fast it won't heat correctly - if you are having trouble let us know! Sometimes the electricity goes out, the same way like in other parts of the world. *Transportation to and from Centro Ashé and airfare not included in our vacation package, only listed items are included in this package. Lodging in one shared room for up to three people, room contains double bed and single bed. Email us which dates you would like to book in order to check availability, then once dates are finalized we work with you to schedule the above activities during your trip! An open mind, heart, and soul! Remember our cabinas at Centro Ashé are very rustic and very simple, we try to live as simply and in tune with nature as possible. We do not have air conditioning and our lodging is very much like our local community members. Coming on this trip and life in the Caribbean here is an opportunity to go with the flow and enjoy a slower and more simple lifestyle - that is part of the medicine of your time here. Bring the cash you'll need to get you through for at least a few days, here in our town we do not have an ATM, so you will need to go to the ATM in the town north of us Puerto Viejo, which has shops, restaraunts, etc. Everyone accepts USDollars. Check the current exchange rate at the time of your visit. If you want to activate your cell phone you can get a Costa Rican chip, you'll need to make sure your phone from the US is unlocked (call your carrier to do this process) in order for the Costa Rican chip to work here. You can get a Kolbi chip directly inside the baggage claim area of the airport before you leave. Remember the San Jose Airport has Free Wifi so you can contact loved ones to let them know you've arrived safely. Most people when they talk about the rainy season it actually refers to the pacific side, which has a very distinct rainy season, 6 months dry, 6 months wet. On the Caribbean its more of a mix through out the year, that doesn't mean it won't rain, because it certainly can and probably will, but there are times of much son as well. As far as clothes, bring light weight stuff that dries easily, it is HUMID! Bring a good pair of shoes to hike with that you don't mind getting muddy, and flip flops, and whatever else you'd like to have with you. Cotton tshirts and shorts are great, a rain jacket, bathing suit, towel for the beach (please do not bring hotel towels to the beach), are all great. BUG SPRAY is important to your comfort here, in the Caribbean we do indeed have mosquitos. So bring repellent that works well for you! Bring natural bug spray if you're into that because you can't get that down there or whatever type of repellent that is actually effective for you, any personal care items you need we recommend you bring with you. Bring any regular medications/supplements you use. Bring sun protection! A hat. Sunglasses. As far as a laptop - there is internet onsite so you're welcome to bring it, just depends how connected you'd like to be! It's another thing to travel with and to be conscious of while you're on buses etc. But it can be convenient, so that is totally your decision. Outlets here are the same as the US, no converter is needed. Come prepared with clothing appropriate for tropical heat and tropical rain. Sandals. Headlamp or flashlight, any prescriptions you need. We do not have laundry onsite but there are places in the area you may pay to get your clothes washed and cleaned. The water in town is okay for cooking but we recommend you purchase drinking water from the local stores. We cannot stress enough how bringing what you need to protect you from bugs will make your stay more comfortable, the struggle is real with mosquitos, sometimes sand fleas and more. Bug bites are more annoying than dangerous. These vary depending on the time of year, but we encourage you to bring protection with you!